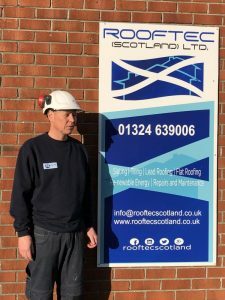 A Falkirk roofer has been hailed as a ‘Local Hero’ for his commitment to raising the standards of the roofing industry by supporting new and young talent. Mark Cattanach of Rooftec Scotland was nominated in the National Federation of Roofing Contractors’ 2018 UK Roofing Awards, sponsored by SIG Roofing, for his dedication to keeping the trade alive by never sacrificing quality for profit. When he started Rooftec Scotland more than 10 years ago, Mark was fed up with the “cowboy” nature of some roofers and was determined to build a business that gives customers exactly what they pay for, without cutting any corners. Aware of the current lack of skilled craftsmen available in keeping traditional slating alive, Mark has been dedicated to promoting the trade to young people in order to close the skills gap – to great success. For a number of years, Rooftec Scotland has been involved in outreach programmes designed to encourage young people into the industry. As representatives of the NFRC in the Forth Valley area, Mark and his staff, including apprentices, dedicate two to three days at a time to attend the many events organised by the Scottish Traditional Building Forum, attended by local school children. His passion for developing young people is already paying dividends with Rooftec’s own apprentice, Connor Liddell, recently being awarded NFRC Scotland’s Apprentice of the Year 2018. Through Mark’s mentorship Connor has not only excelled within his position he is following in the firm’s footsteps by giving back and passing on his experiences to the next generation of roofers. In 2016, Forth Valley Chamber of Commerce approached local companies with the opportunity to become a board member for its Developing the Young Workforce (DYW) regional group. Rooftec took on the role as it was an opportunity to open up a channel of communication between schools and businesses. He said: “For a number of years we could see how the young workforce is instrumental in closing the skills gap but we were getting frustrated because we were unable to reach them. We tried to engage with schools but the uptake was quite poor. In April 2017, by arrangement of the DYW, Mark met with a pastoral teacher at Falkirk High school, who wanted to inspire a group of disengaged fourth years who were ready to walk out the door as soon as their final exam was over. Mark and Nicola gave a 45-minute talk in which he spoke to the kids about the many advantages of pursuing a career in the roofing industry. One boy was so enthused by Mark’s talk that he became the first modern apprentice to be employed by Rooftec as a direct result of DWY Forth Valley’s efforts. Finally, to further support local schools Mark has adopted a “Roofing in the Classroom” lesson plan, which has been piloted with five local schools. The initiative was supported by Historic Environment Scotland with a £5,000 grant to launch it and Mark matched this to deliver the sessions. The annual National Federation of Roofing Contractors UK Roofing Awards recognises the best of the best in the roofing sector. As the awards’ headline sponsor, SIG Roofing was also pleased to support the Local Hero awards as a way of acknowledging outstanding roofing contractors who go the extra mile for their local community and are so often unsung heroes.